The mystery continues to unfold at the site of last year’s massive oil spill. Flyover surveillance footage taken Nov. 12 reveals no fewer than nine large oil-related work vessels in the waters surrounding BP’s Macondo Prospect. Vast expanses of surface oil have been reported at the site since we broke the story here on this blog in mid-August, but both BP and the U.S. Coast Guard have been unable – or unwilling – to identify the source (see link to my breaking post below). We saw lots of “work” vessels out in the Macondo today! And new orange buoys we hadn’t seen before. Our southeast-bound route took us past the platform “VK989″ at about N28°58′ W088°37′, and the first two orange buoys we saw were a little over 50 miles off shore to the east-southeast. 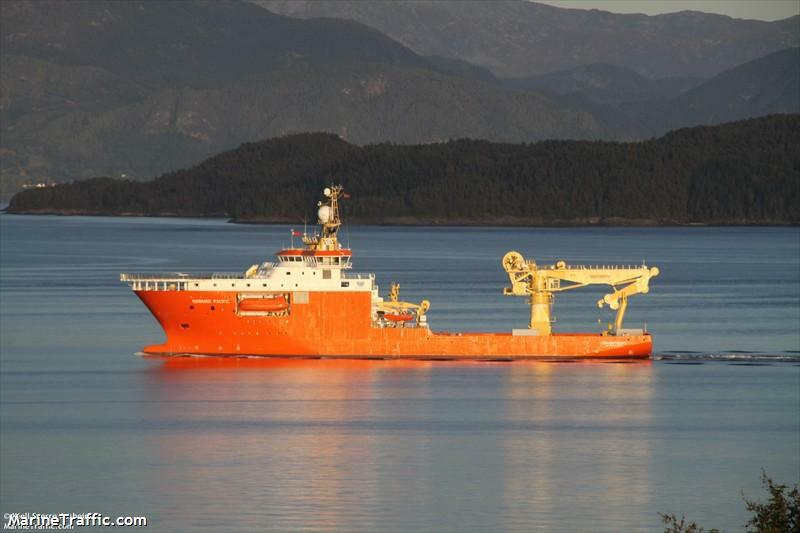 Thence came a progression of oil-related (BP-contracted, we think) work vessels, some ROV-capable and more. These included the Meg L. Skandi, C. Chariot, Monica Ann, Normand Pacific, Sarah Bordelon, Deep Blue, HOS Iron Horse, Brooks McCall, and Holiday. 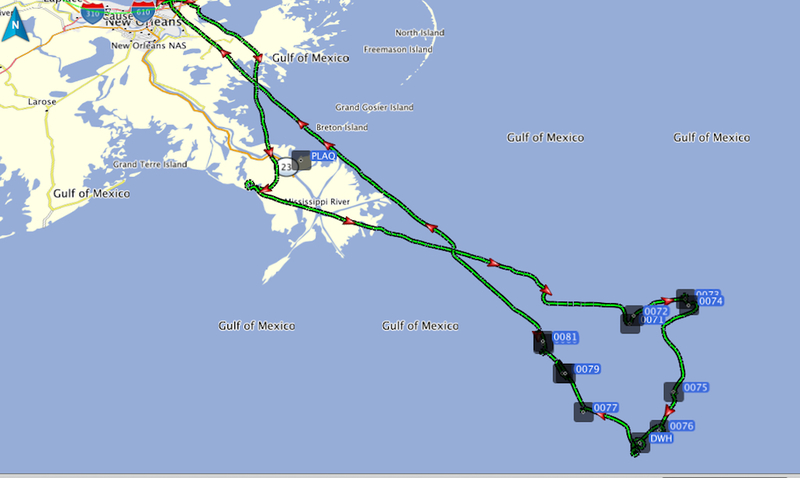 That’s a lot of vessels in a tight area of the Gulf of Mexico. We’re talking about a big operation – and an expensive one. For example, the Normand Pacific, flying under the flag of the United Kingdom, is equipped for diving and ROV operations (see file photo below). The vessel is well over a football field long. According to the website Marine Traffic, the Holiday, flying under the American flag, departed out of Port Fourchon and arrived at a destination listed as “MC 252″ (the abbreviation for the location of the Macondo Prospect) on Nov. 5 at 9:00 a.m. (see file photo below). My guess is the cost per day of operating a fleet of nine vessels like this has to be in the seven-figure range. You have to wonder what kind of alarming subsea scenario would demand that kind of expenditure. Here is a map of Schumaker’s flight path. You can see the Deepwater Horizon site, marked by the black square labeled DWH. The other black squares signify the vessels in the area (see link to Bonny Schumaker’s On Wings of Care website below for full report, photos and video). Only when we reached the Holiday was the visibility good enough for us to identify unequivocally a line of oil “globules,” and they were very near the Holiday. That vessel was almost stationary but there was quite a bit of exhaust coming out of a stack on it, as if it were running a pump or something. We saw several other such lines of sheen that did not resemble the usual wind-surface patches or lines, but we did not have time to fly over to them to inspect them closely. So what does all this activity mean at a site where large oil slicks have been observed for months and a BP-Macondo fingerprint has been established? Based on Schumaker’s aerial observations, it would seem the vessels are out there for at least two reasons: (1) To identify the source of the surface oil through ROV footage; and (2) To recover leaking oil before it reaches the surface (and the prying eyes of the public). I should note that the line of “oil globules” observed by Schumaker is in the vicinity of a known natural oil seep. But the current level of activity – punctuated by the presence of nine vessels – surrounding the Macondo Prosepect cannot be explained away by a natural seep, particularly one that has been known about for years. There seems to be a great deal of work going on out there – well, a large number of work vessels out there, but we couldn’t see any work being done from above the water’s surface! Several vessels had cables going down, so they may have been working with ROVs or other equipment sub-surface. We did see the above-mentioned line of oil. Note that all of these vessels are in the same areas that we have documented signifcant quantities of surface oil since August and in particular on our flights dated Aug 30, Sep 10, Sep 11, and Sep 27. We saw no whales or whale sharks or dolphins or other large marine life for this entire flight. There was one other fixed-wing (multi-engine high-wing propeller) airplane that passed us at our altitude (about 800′) on our return, just north of the Holiday and the line of oil; we could not read its registration numbers. As you can see from Schumaker’s footage (see link below), the Macondo Prospect has become a beehive of activity with a swarm of oil and vessels. Though both BP and the Coast Guard have been running from this escalating “situation” for months, it’s impossible to hide the severity of a problem that requires the presence of nine large, oil-related “work” vessels in a relatively tight area surrounding the Macondo wellsite. 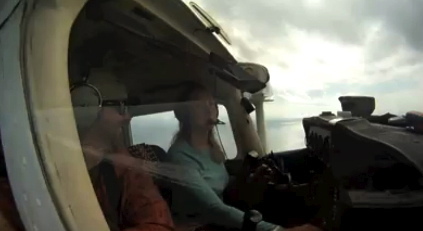 In the absence of even a modicum of transparency or anything resembling leadership on the part of our federal government, Ms. Schumaker’s flights over the Gulf represent the public’s only regular access to the site of last year’s 200-million-gallon spill. We salute her relentless effort to uncover what’s really happening in the waters 60 miles off the Louisiana coast. And she continues her invaluable work in the face of an ongoing, aggressive campaign of obfuscation and misinformation executed by BP and our very own Coast Guard. Bonny Schumaker is a hero of the Gulf Coast. She deserves a medal for her tireless pursuit of the truth. Please visit her site to see the amazing work her organization is doing – and to donate to the cause. We will continue to bring you updates on this story as details emerge. ← Earth from the Space Station – THE Video of the week! If what they’re doing, with nine vessels, was something “good”, wouldn’t they be self-praising and informing the media? And whatever happened to that live underwater video link during the leak? Ironically, I just read that BP has just been granted a contract do to more work in the Gulf. Whyyyyyyyyyyy??????? I do know that soon a salvage company will be salvaging the collapsed platform off the bottom. 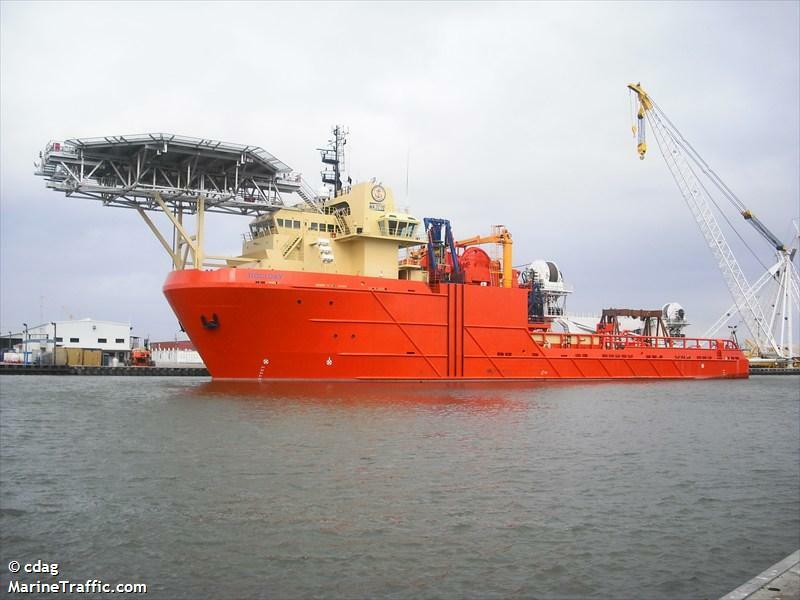 There was also a ship in Pensacola Port recently that picks up platforms and also the one you have pictured was here within the last few days. It was here for some repairs so this may be what is going on.. Thanks so much for the info. That’s really interesting – what a job that’s going to be to pick that huge platform up off the bottom and bring it up – it’s almost a mile down. I’ll pass this on. Tellem girl I wanna know that myself!! Couldn’t find anything on the Holiday (too many cruise ships with the same name), or the Meg L. Skandi (nothing beyond this article, articles that quote it, or other sitings in the same area. Ian – thank you for the research. I will forward this on to Bonny and I am sure it will be useful in our investigations. Very interesting, eager to read each one of your links!